For lovers of Sherlock, Shardlake and Ripper Street. 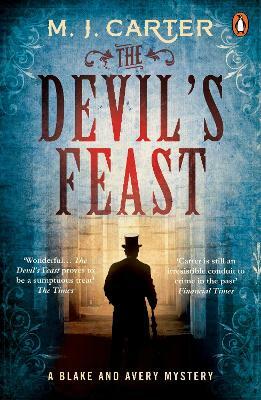 A hugely enjoyable heart-pounding Victorian thriller: murder, a celebrity chef and a great detective double-act. London, 1842. There has been a mysterious and horrible death at the Reform, London's newest and grandest gentleman's club. A death the club is desperate to hush up. Captain William Avery is persuaded to investigate, and soon discovers a web of rivalries and hatreds, both personal and political, simmering behind the club's handsome facade - and in particular concerning its resident genius, Alexis Soyer, 'the Napoleon of food', a chef whose culinary brilliance is matched only by his talent for self-publicity. But Avery is distracted, for where is his mentor and partner-in-crime Jeremiah Blake? And what if this first death was only a dress rehearsal for something far more sinister? M. J. Carter is a former journalist and the author of the Blake and Avery series, The Strangler Vine, The Printer's Coffin (formerly published as The Infidel Stain) and The Devil's Feast, and two acclaimed works of non-fiction, Anthony Blunt: His Lives and The Three Emperors: Three Cousins, Three Empires and the Road to World War One. M. J. Carter is married with two sons and lives in London.